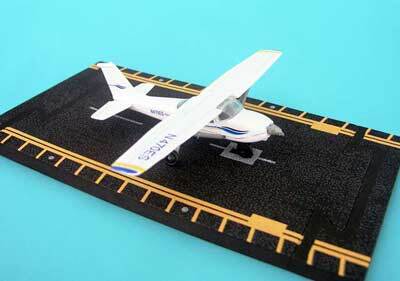 The Hot Wings Cessna 172 is a die-cast metal airplane that measures approximately 4"x5" and comes in a white paint scheme with blue and yellow markings. The die-cast toy comes with a fact card and a flexible, modular runway piece that you can use to create your own airport. Additional runway and intersection pieces are sold separately. This collectable die-cast Cessna 172 toy is recommended for ages 3 and up.